Anointed man of God, Prophet Mboro recently embarked on yet another journey to heaven. And this time the man of God brought proof of his journey to heaven. 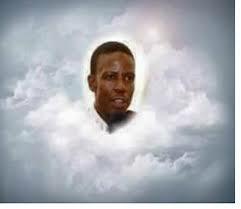 According to Mboro he went to heaven and this time he convinced our Lord Jesus Christ to come back with him to the land of the living and the sinning. "Convincing Jesus to come back down with me to earth was not easy, i had to convince both him and his Xhosa wife who did not approve at all because last time Jesus was here he was betrayed!" Said Prophet Mboro. According to Mboro, he begged Jesus to come down from heaven because he felt that the Lord's children needed to be saved. With all that's going on in South Africa and the rest of the world Mboro felt that the presence of Jesus would make all the difference. But according to Mboro, as Jesus was walking down from heaven he saw what has become of the world and he decided it's too much and then he just walked past and didn't come down. Mboro says Jesus felt that the world is in a worst state than he left it in when he died for our sins. "The world is coming to and end, everyone will be wiped from the earth and then it will be a new start and a new world with no sin, only then will Jesus Christ come down from heaven!" Said Mboro.